Countries Visited: Zimbabwe / Zambia, Botswana, Namibia & South Africa. Included are three hearty meals a day, (unless otherwise specified). Vegetarians are easily catered for and they're always impressed by our varied menu. Our guides can produce miracles on a camp-stove. Special dietary requirements can be catered for, but only by special request. In East Africa it is more difficult to cater to certain requirements. Today is your arrival day; please meet your guides between 9am and 4pm at the Savanna Lodge (or other accommodation advised). It's a good idea to arrive the day before if you want to arrange an optional activity for today. 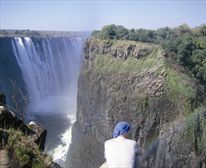 Tomorrow morning on Day 2 we will visit Victoria Falls itself. There are no included meals today. Most people will spend the day White Water Rafting which includes lunch, a not-to-be-missed experience of a lifetime! Vic Falls offers many exciting alternatives. Choose carefully as almost all of them are really worth doing, speak to your guides or the staff at Savanna Lodge for some advice. Please be aware that you cannot use credit/debit cards in Zimbabwe, so cash (Rand or USD) is best. The prices of the activities are listed at the beginning of this dossier so you can make sure to bring what you need. Optional Activities: White Water Rafting, Bungee Jump, Elephant Excursion, Dinner out. 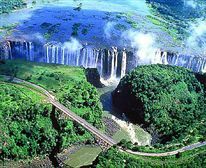 After breakfast we visit the spectacular Victoria Falls National Park and experience the thundering of the mighty Zambezi. The entrance is included in your local payment. We allow approximately 2 hours here so you can visit all the view points and photo opportunities. When we arrive at Kasane we set up camp on the banks of the Chobe River. The afternoon is spent game viewing with an optional game drive followed by an included scenic boat cruise in Chobe National Park. This is an excellent opportunity to view Africa's spectacular wildlife. Optional Activities: Chobe NP game drive. An early start and our journey takes us towards Maun. 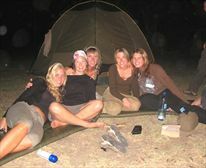 We spend the night here (Maun) and prepare for our 2-night bush-camping experience. Your guides will provide you with a briefing about the next few days activities and the community run tourism operation. There is an optional scenic flight over the Okavango Delta in the afternoon. 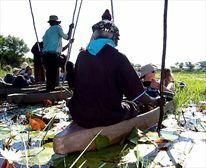 Optional Activities: Scenic Flight over Okavango Delta. After breakfast we board our local truck transport for the 2 hour trip into the Okavango Delta, where we meet with our local guides and polers for our mokoro (traditional canoe) trip to our remote bush camp. In the afternoon there is a nature walk with a local guide which gives a great chance to view wildlife on foot. Tonight is spent swapping stories around the camp fire and enjoying serenity of the Delta. There is normally an early morning nature walk with your local guides, splitting up into small groups so there is a better chance of seeing the wildlife. This is followed by breakfast and a relaxed day around the camp site. Often there is the chance to swim in the clear water. In the afternoon we take another nature walk or perhaps a mokoro trip along the river. lunch and a relaxing afternoon. Another early start and we drive to Ghanzi. Once at camp we will meet with a local Bushmen community and experience some traditional Tribal Dancing. Optional Activity: Guided Walk-Hunting Gathering/Village, Trance Dance (must be booked in advance min 6 x participants), Game Drives (min 6 x clients). Today is a long driving day to the Namibian border and onto Windhoek in the centre of Namibia arriving in the early evening. We check into our centrally located hostel (or similar) where the accommodation is dorm style multi sharing. Tonight there is an optional dinner out in town. Optional Activities: Dinner out at Joe's Beer House. Leaving the city sights behind, we travel north into Namibia's barren northern area. 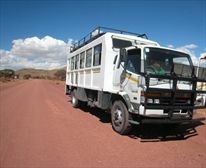 We enter Etosha National Park and game drive through to the Okaukejo campsite. On the 2nd day, more breathtaking game viewing and a night at the Halali camp. Etosha National Park is the venue for some of the most unique game viewing experiences in Africa. We will go on various game drives, and spend our evenings at the abundant water holes for some excellent game photography. Leaving Etosha we drive towards Kamanjab. The Himba are a pastoral people and predominantly breed cattle or goats, they are easily recognisable by their unique style of dress. Today you have the chance to visit the Himba camp and see how these interesting people live. The facilities at our camp site are minimal, so its best to treat this as bush camping, however there are basic showers and toilets. 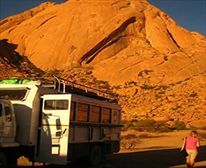 From culture to creation we travel to the mysterious Spitzkoppe. Tonight we camp in the wild. 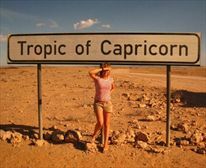 Today we travel to Namibia's Atlantic coast and Swakopmund, Namibia's adventure capital. You will be briefed on the optional activities available here. At night there is an optional dinner at a local restaurant where you can try different types of local dishes. 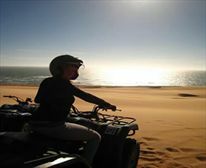 Optional Activities: Quadbiking, Sandboarding, Sky Diving, Dolphin Cruise, Scenic Flights, Fishing, Dinner out etc. 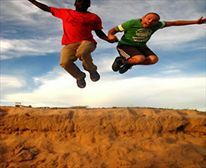 Your chance to experience the adrenalin filled atmosphere that Swakopmund offers. Most activities include a pick up and drop off service to/from your hostel. You can also take time to go to the internet and wander through the shopping streets. 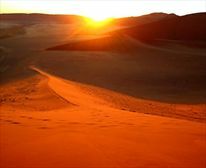 After the adventure and adrenaline rush of Swakopmund, we drive south into the mysterious Namib Desert. We arrive at camp in the afternoon and enjoy a short hike at Sesriem Canyon. Tonight we enjoy dinner around the campfire. We wake before dawn for one of the highlights of the trip, hiking up Dune 45 to watch the sun rise. After breakfast we join a local expert on a guided tour explaining the desert ecosystem, then after lunch we drive to Hammerstein. Today we travel south to the Fish River Canyon where we hike along the canyon and see the amazing sunset. (It is possible that you may see the sunrise at the canyon next morning instead due to the road conditions or time of year you are travelling). Today is a long drive through the Northern Cape to the fruit producing area in the Cederberg mountains of South Africa. After setting up camp (weather permitting) we go on a guided walk to see Bushmen paintings and learn about the native fauna and flora. Our final day on tour, we head to the mother city, Cape Town. Travelling along the coast road we stop at Table View for a magnificent view of Table Mountain from the other side of the bay. The local payment is a USD cash portion of the tour payment that needs to be paid directly to your guide in Africa. This payment covers fluctuating expenses such as flights, National Park fees, entrance fees ect & also ensures that we have a reliable amount of hard currency on each tour. Our local payment is not a kitty, your food & accommodationare included in the tour price. All local payment amounts are subject to change without notice. Changes are very rare & are normally due to a sudden or unexpected price increase by a local service provider or National Park. All of our tours are priced on twin share accommodation. The single supplement is not compulsory on our camping tours but if you want your own tent you need to pay the single supplement. If you are booking one of our accommodation tours alone you have to pay the single supplement. There are a maximum of 4 single supplements available on all tours. All people who join an adventure tour need to be in good health. Medical facilities are not always available. If you have a specific medical condition it is compulsary for you to advise us before departure. Malaria is a real concern in many areas of Africa, especially during the rainy season. Our advice is simple, prevent getting bitten by using an insect repellent and use an effective prophylactic. Speak to your doctor before selecting your Malaria medication. Please ensure you have the relevant vaccinations. Proof of innoculation is required on certain tours. Rate per person sharing. Single supplement R550. Local Payment USD 270. Rate subject to change without prior notice.